If you find yourself spending more and more time in the bathroom trying to look your best before work or for an important event, you’re not alone. Many women find themselves spending way more time than what’s necessary getting ready. 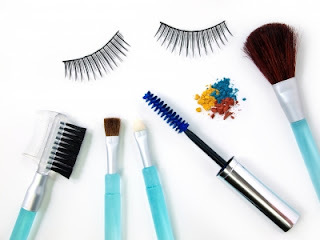 They take too much time on many fashion and beauty activities, such as tweezing their eyebrows, adding to the current clutter, or wearing false eyelashes. Instead of using too many products and spending hours to get ready, get organized and figure out timesaving beauty and fashion tips that will work best for you. You’ll be able to get ready in half the time! Get Rid of the False Eyelashes – If you’re caught up in falsies then you know how much time it takes to apply them, let alone take them off. In addition to how much time it takes to get them to stick on top and bottom part of your eyelids, it also takes time to take them off. Instead of wearing false eyelashes on a daily basis, opt for a prescription lash-grower or better yet, apply quality mascara. Over time if you continue to use false eyelashes, your real lashes will break off and it will take you years to grow them back. Organize Your Closet – Is your closet too full because you have a difficult time getting rid of any clothing that’s there? If you’re a pack rat it’s time to break down and give away or sell some of your clothing. You’ll be able to pick out an outfit for work a lot easier if you have fewer outfits to choose from. Once you’ve gotten rid of clothing that you no longer wear, it’s okay to buy a few new outfits that work with your style. Use coupon codes and other common sense shopping techniques to help you save money. In fact, there are working nyandcompany.com coupon codes at Sidepon.com. Use a Razor that Comes with Moisture – Skip some steps in the shower and don’t worry about lathering up your legs, especially if you use a razor that comes with get bars made with body butter. Not only will the gel bars help you prevent cutting your legs while you have, but it will cut your shower time in half, allowing you to get some extra shut eye in the morning. Switch up Your Hairstyle – If you’ve been wearing the same hairstyle for years and it happens to take you a lot of time, think about switching things up by either trying a new hairstyle that takes less time or get a haircut. Sometimes having shorter hair is less time consuming to style. Also, layering longer hair will help you style it a lot more easily and spend more time on other activities such as putting on your makeup and picking out your outfit for the day.